Growing up, I was obsessed with shoes. When it comes to shirts, pants - I can wait for how many months just to save a penny to buy those things but when it comes to shoes, I simply can't help myself. Thanks to my Mom who's really supportive to me. Anyways, that was before. Long before when I was still in school. Well, I am now working and trying hard to earn money just to buy the things I want. I am no longer receiving allowances from my Mommy and I rarely go to mall to buy new stuff for myself especially shoes. urbanAthletics bravely combines athleticism with urban fashion. As new fashion forms broke out across the globe, we saw how sportswear evolved into streetwear, and vice versa. This fashion phenomenon led us to bring together elements from skateboarding, parkour, music, street culture and everything in between to allow every urban hipster invest new styles and make a statement on the streets. It was my pleasure when I saw Pinoy Urban Music's blogging contest! Perfect timing for the Christmas season! I am badly in need of new shoes for the season. I am sure that I'll be seeing people this Christmas wearing new pair shoes, new clothes, new pants, etc. At least, if I'll win the contest, this is a sure thing that I will wear this pair on Christmas day. Promise! Haha! And also, urbanAthletics for lifestyle shoes for the younger crowd and that still includes us, right? So hip, so young and so cool just like me. Ahemmm... Just perfectly fit for me. Launched in 2008, Radii, defined as a range of influence, set forth to show there is no limit to fashion, creative styling, and opportunity. Radii Footwear’s goal is to exceed the expectations of the current consumer climate by offering quality products, creative concepts, comfort and value. Radii Footwear’s creative team thrives off the principles of functionality and fashion forward ingenuity. From futuristic designs and materials, to classic styling and detailing, each shoe exudes confidence for the ambitious forward- thinkers of the world. I am really interested in footwear and like wearing different types of shoes, one of the best international brands that you can purchase from is Radii. 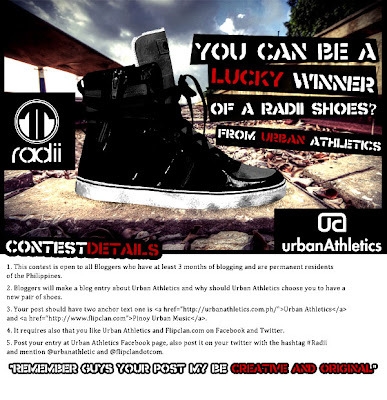 Radii footwear is renowned across the globe for manufacturing some of the best and the most stylish shoes around, and they generally specialize in making sneakers and joggers that are worn mainly by hip hop artists and rappers. Now, I am so much excited since I am sensing that I will win this contest. Many of these hugely popular television artists have now endorsed Radii footwear and have begun wearing these shoes, and they have also begun to be featured in music videos, further adding to the popularity of these shoes. If you are interested in purchasing sneakers that have a unique design and are made from strong and sturdy materials, choosing this brand could be one of the best decisions, because the company has a very high record of satisfying its customers. You live but once--you might as well be amusing. You can still join the contest: Follow the mechanics at the poster.